Belarusian people began migrating to North America many years ago. As such, many have assimilated. The population figures for the Belarusian only includes first generation Belarussian. Belarusians value hospitality, cordiality, and friendliness evidenced when eating with them their cuisine. Their cuisine uses a wide variety of grains, a diversity of mushrooms, meats, and many kinds of fish dishes. There are, of course, a number of items which Belarusans share in common with their Slavic neighbors: halubcy (stuffed cabbage), borscht, and kaubasa (kielbasy). One well known cuisine is the bagel. The traditional bagel comes from the town of Smarhon in the northwestern part of Belarus. The majority of Belarusian are Orthodox Christian. However, another major group of Belarusian immigrants to North America are Belarusian Jews who migrated starting in the mid-19th century, having faced discrimination in the Russian Empire, which Belarus was part of at the time. Pray for Belarusian people to find not just economic prosperity, but the riches of new life in Jesus Christ. Pray for workers to raise up to reap the harvest among Belarusian people who are more open to Christianity. 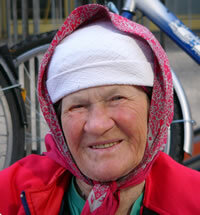 Pray for the evangelization and discipleship of Belarusian people.